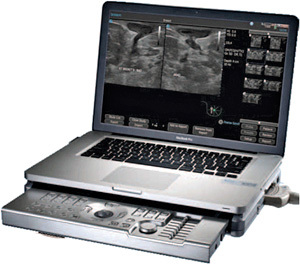 Terason t3200 Turns Your MacBook Pro Into An Ultrasound Machine | OhGizmo! Ok, so it’s not exactly a kit you can buy, but a company called Terason, who specializes in these kinds of portable ultrasound machines, has just released their new t3200 Ultrasound System designed specifically for breast surgeons. Built around a MacBook Pro the ultrasound machine is not only highly portable, it also allows the imagery being collected to be easily integrated into a doctor’s workflow since the t3200 is a full-fledged computer. So emailing scans, sharing files on a network or checking a patient’s chart data can all be accomplished from the same machine. As for pricing? Start with the MSRP of an MBP and then add on a few thousand dollars and you’re probably getting close.